Gerard Butler In «Machine Gun Preacher»One night after the orphanage has been rebuilt, he and his friends from the SPLA are attacked on the road by the LRA, they manage to chase off the small force of the LRA that attacked them. They then search the area and discover a large group of Sudanese children hiding in a ditch not far from the road, since they can not take all the children in one trip, Sam chooses to take the ones who need medical attention along with a few others on their first trip back to the ophanage. However, upon returning to the spot as quickly as he could, he finds that the LRA burnt those he had left behind. It is from here he leads armed raids to rescue children from the LRA. In the end credits are included black and white pictures of the real Sam Childers, his wife and his daughter plus his orphanage in Sudan. The pictures are followed by a short black and white home video clip of Sam talking about his work, all the while with the credits rolling on left hand of the screen. 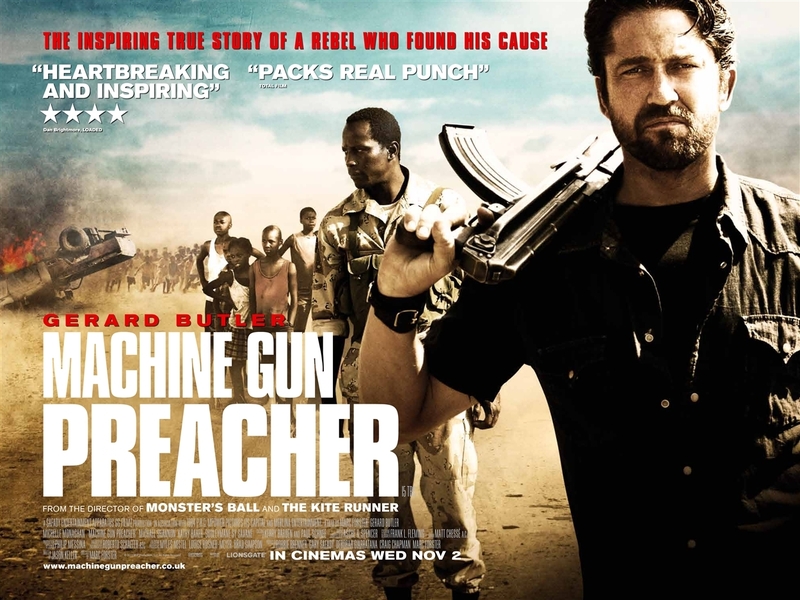 Machine Gun Preacher is a 2011 action biopic film about Sam Childers, a biking preacher-defender of African orphans. The movie was written by Jason Keller, directed by Marc Forster and stars Gerard Butler as Childers. It tells the story of Childers and his efforts to save the children of South Sudan in collaboration with the Sudan People's Liberation Army (SPLA) against the atrocities of the Lord's Resistance Army (LRA). Filming commenced in June 2010 in Michigan. The film had a gala premiere at the Toronto International Film Festival on September 11, 2011 and limited release on September 23, 2011.